Why “those who don't know history are doomed to repeat it”? These widely known words belong to Edmund Burke, British political theorist and philosopher of 18th century. Some people keep him in memory especially in the USA as MP of the British Parliament arguing in favor of American colonists against attempts of the government of King George III to strengthen the royal power. As before there are many cases in a modern world proving the truth of Edmund Burke's words. And it seems to me we can see one of particularly extraordinary case when we consider development of relations between Europe and Russia in the gas field that began as far back as the Soviet Union times. Scanning the past we have to realize that for more than 40 years ultimately overpassing all political contradictions and collisions of interests energy always remained the theme number one within relations between Europe and Moscow. In fact, it all commenced in the 1960s when despite a prolonged state of cold war the representatives of energy sector from West Germany and the USSR started negotiating the very first gas contract. At those times they shaped a concept of signing a long-term agreement between West Germany and the Soviet Union envisaging supplies of super-diameter steel pipes and other equipment for construction of pipeline that overall had to be paid back by natural gas transported from Western Siberia to Europe. In this regard that long term agreement remained in history under the name of "gas for pipe". In 1960 under that long-term agreement Soviet trade organizations placed orders for super-diameter pipes at German manufacturers. However in April 1963 Bundeskanzler of West Germany Konrad Adenauer put under a ban implementation of the agreement arguing that it's fulfillment "threatens security of Germany". The government of Western Germany followed recommendations of the Coordinating Committee for Multilateral Export Controls (CoCom) and referred to "interests of allies security". This decision resulted in abnormal losses - in consequence of breaking the contract for shipments of steel pipes company Mannesmann lost from 80 to 100 mln Deutsche Marks. Krupp company suffered the same significant losses. It was known widely about a distinct role of the US politicians who demanded that their NATO allies should wind up cooperation in the gas field. It was argued among other reasons rather seriously that in case of war actions the pipelines from the USSR might be applied for providing Soviet tanks with fuel. Refueling tanks directly out of a long distance pipeline?! You hardly can imagine something like that even for a science fiction film, can’t you? Much later in 1969 when for the first time Bundeskanzler Willy Brandt headed the German government the eastern policy of West Germany changed significantly. Next year already after 10-month negotiations three agreements were signed according to which USSR was obliged to deliver annually 3 bcm of natural gas. The German party represented by company Mannesmann undertook obligations of paying for received fuel by means of shipments of 1,2 mln ton steel pipes necessary for construction of gas pipeline to the West. By the way this volume of pipes correspond to 1,5 thousand kilometers of pipeline but in the whole the construction needed 4,5 thousand kilometers. In return company Ruhrgas from Essen purchased Soviet gas. As a result of that barter agreement "gas for pipes" called then as the East-West "deal of the century" because of its scales a commercial scheme "transport infrastructure and finance in exchange for gas" was fulfilled for mutual benefit. In total the construction of three pipelines was implemented including Orenburg - Western border, Urengoy - Pomary - Uzhgorod and Yamburg - Western border. All of them are in operation up to now continuing supplies of Siberian gas to Europe. However, as you aware it was far from the end of the history of political pressure on relations in the field of gas between Europe and the Soviet Union. Yet another severe impact happened in 1980s when the US pressure on West Germany constituted in order to prevent further development of relations in the field of gas. As it was pointed out the Soviet Union needed financial resources for military purposes and especially for expanding an invasion into Afghanistan. Regardless of the consequences reasonable economic interests and common sense of our European politicians prevailed over these arguments and in 1981 company Ruhrgas and Soviet organization Souzgasexport made a new contract that envisaged shipments to West Germany 8 bcm gas annually from 1984 till 2008. Nevertheless under the US pressure a ceiling of 16% was imposed in respect of the share of Soviet gas within annual consumption in West Germany. Further relations with Russia in the field of gas went on expanding both in West Germany and in other European countries. Now share of gas from Russia within a total annual volume of the EU consumption accounts for about 30%. Diversification of routes of gas supplies to Europe has developed too. 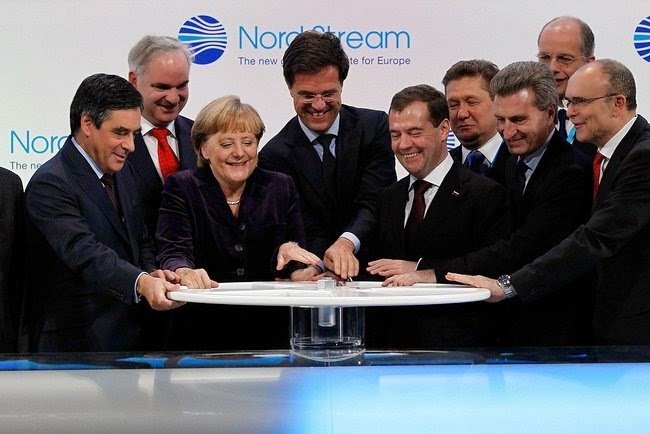 In November 2011 direct shipments of gas to West Germany from Russia via Nord Stream pipeline were started bypassing transit countries what as many of us realize should increase security of supplies. And in the beginning of 2014 German company Europipe had got a contract with regard to supply 330 thousand ton of steel pipes for offshore section of South Stream pipeline costing about 500 mln Euro. Meanwhile do not forget what we are speaking about - ultimately the times of political spin in gas relations have not remained yet behind in the past. It's not possible for me and obviously for you as well to imagine that nowadays politicians may seem to see "Russian tanks... on pipe". However, as before energy relations are conditional upon different political circumstances. Is there a rational point for us in that a timeworn tendency is prevailing to use energy relations tried-and-true in the past for building political leverage. Why aren't we able to see new attempts of ignoring economic feasibility obviously existing at different levels - from a macro level of dozens of European states further to levels of dozens thousand of enterprises and many hundred thousand our households? For somebody probably it sounds like why aren't we able to see the back side of the moon!? Why that we don't learn from the lessons of history as a matter of fact often is the most important of all the lessons that history has to teach us?